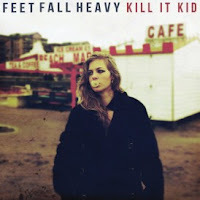 Bath based Kill It Kid released their self titled debut in 2009 and now, after leaving the violin behind, they’re back with follow up 'Feet Fall Heavy'. This album sees the band further showcasing their love for the Deep South with snippets of field recordings from renowned folklorist Alan Lomax, adding all round authenticity to the record. The album begins with a said recording as part of 'You’re In My Blood', shortly accompanied by Stephanie Ward’s smouldering vocals, and adequately sets the tone for the rest of the album; gritty but soulful. Chris Turpin takes the lead vocals on next song 'Heart Rested With You'. Opening with a melodic modicum of keys and strong beats, the impassioned vocals mix perfectly, creating a true blues song. Ward takes on the main vocals again in fierce 'Pray On Me', the enormous, mountainous highlight track of the record. Opening cacophonously, you can tell you’re in for something huge from the outset. Vocals switch from Ward to Turpin, and for the first time on the album sees them combine superbly in this energy fuelled number. Other highlights include haunting 'Dark Hearted Songbird' where Ward’s vocals now switch to haunting, and are similar to that of Karen O’s and the country-folk-rock unabating 'Run'. Unsurprisingly, the album was recorded in just ten short days, and it shows, in the most refreshing way. “The process began with a want to create an album with an immediacy and honesty. In an industry where months are spent grooming and pre-producing the perfect electro-surf-nu rave-outfit to suit the necessary tastemakers, we knew creatively we needed to record fast, keep it raw, inelegant and untainted” says Turpin, and that untainted rawness is definitely reflected throughout. Record closer 'Let My Feet Fall Heavy' was an excellent choice to end on. Building up to the tumultuous strumming of guitars and then dropping back down to that teasing David Gilmour-evoked plucking keeps you on your feet, despite it being the end of the album. In personal opinion, this second album has surpassed the first, and with it, Kill It Kid are already on their way to establishing themselves as a true rock-blues band. 'Feet Fall Heavy' is available to purchase at iTunes, amazon.co.uk etc.